Rosacea is a chronic skin disorder that affects the central area of the face—usually the nose, cheeks, chin and forehead. Untreated, it usually worsens over time, being a progressive disease. Rosacea has been categorized into four subtypes, based on features that often occur together. 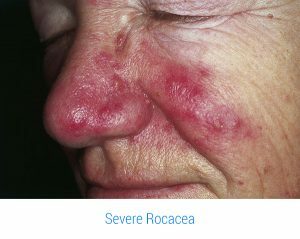 Rosacea usually begins as the first subtype with flushing and redness, later progressing to the second subtype involving papules and pustules (blemishes). The third subtype is not as common, involving thickening and bump formation, usually on the nose. This occurs more often in men than in women, and was mistakenly called “whisky nose” in the past because people incorrectly thought it was a sign of alcoholism. The last subtype, ocular rosacea, affects the eyes. This subtype often occurs in conjunction with the other subtypes, and may even occur on its own. It affects about half of those with rosacea. A particular parasite, the Demodex folliculorum mite, has been found in higher concentrations on the affected skin of people with rosacea. It is thought that this mite may play a role in triggering the inflammation of rosacea, either directly, or by carrying a bacteria that triggers the inflammation. Interestingly, this bacteria, Bacillus oleronius, is destroyed by the typical antibiotics used to treat rosacea, but when antibiotics that do not affect B. oleronius are used, they are not usually effective in treating rosacea. It appears to be necessary for B. oleronius to survive and thrive in order to keep the rosacea active. The Demodex mite is the vector carrying the bacterium, similar to the mosquito being the vector for carrying many microbial diseases. A link has also been found between rosacea and the bacteria Helicobacter pylori, which also exists in people with peptic ulcers and gastritis. Though studies are conflicting, H. pylori has been suggested as being involved in rosacea, and that H. pylori eradication may be helpful in rosacea treatment. Another gut-skin connection in rosacea is low stomach acid, or hypochlorhydria. Patients with rosacea have been found to have decreased stomach acid production. This would also explain the presence of H. pylori, which thrives under low stomach acid conditions. Dysbiosis must also be considered. Dysbiosis is an imbalance in the ratio of good to bad bacteria in the gut. One type of dysbiosis, known as small intestinal bacterial overgrowth (SIBO), involves an overgrowth of bacteria at the end of the small intestine. Usually the largest concentration of bacteria is located in the large intestine, or colon, but in SIBO, this bacteria backs up into the small intestine where it causes inflammation. People with rosacea have been found to have SIBO more frequently than healthy people. What is even more remarkable is that, when SIBO is eliminated, rosacea almost completely disappears. This is a strong indicator of the gut-skin connection. When optimal digestive health, including balanced microflora is achieved, the body is more able to heal and defend itself from invaders. Dysbiosis can lead to a condition known as leaky gut, or increased intestinal permeability. This occurs when the lining of the small intestine becomes inflamed and damaged allowing larger than normal particles to enter into the bloodstream. These particles may be partially undigested food or toxins (either bacterial toxins or environmental toxins) that were ingested with food. From the small intestine, these toxins are transported to the liver for detoxification. When the liver is overburdened, or when it is sluggish and not functioning well, it may not be able to effectively detoxify, and some toxins may spill over into the bloodstream and circulate throughout the entire body. Toxins or food allergens (perceived as toxins) are attacked by the immune system in the gut lining, the gut wall, the liver and the bloodstream causing inflammation. This inflammation may manifest anywhere in the body. The body will still try to eliminate these toxins, however, and one other pathway of elimination is through sweat. This elimination of toxins through the skin is likely to be the underlying cause of most skin conditions, including rosacea. These toxins further activate the local skin immunity, which leads to more inflammation and decreases the skin’s ability to eliminate the toxins. Too much sun, humidity, or radical changes in skin temperature, and the application of hundreds of cosmetic or sun-block chemicals may further aggravate the condition. Another gut-skin connection in rosacea involves gut transit time, or the amount of time that it takes food to travel through the entire digestive system. In one case study, a patient with rosacea experienced complete remission of symptoms after decreasing gut transit time to below 30 hours. The best way to decrease gut transit time is to consume enough fiber—at least 35 grams per day and to exercise and stay well-hydrated. Slow transit time is simply an opportunity to absorb more toxins due to colonic stasis (inactivity). The Standard American Diet (SAD) does not even provide half of the 35 grams of fiber that are needed on a daily basis. Extremes in weather are a major trigger for rosacea. Hot and cold temperatures, as well as moving from one temperature to another, can activate rosacea. 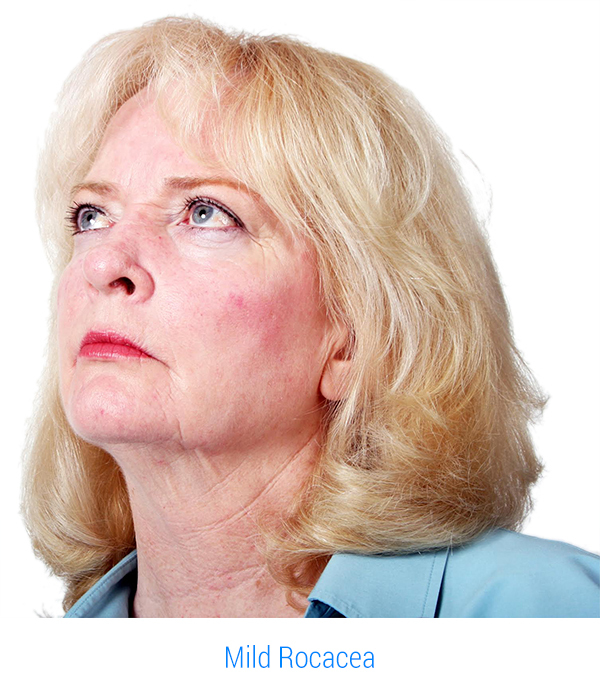 Wind and sunlight can also induce a rosacea reaction. Some people find they need to avoid all types of extreme weather and temperatures, which can be difficult. Up to 40 percent of rosacea patients report having a family history of rosacea. In addition, certain ethnic groups are more affected by rosacea than others. People with fair skin, of Northern European and Celtic ancestry tend to be more prone to develop rosacea. Pre-rosacea is sometimes identified as the tendency to blush easily, which progresses to a persistent redness of the central area of the face. Though people who tend to blush easily are more prone to develop rosacea, it is not necessarily accurate to define them as pre-rosacea. There are many gut-skin connections with rosacea as there are with other skin diseases. Rosacea is one of the more obvious “in your face” (pun intended) examples of the fact that most illnesses are an inside job starting with what is happening the gut. I personally think it is unacceptable to treat premenstrual syndrome (PMS) rosacea with oral contraceptives. PMS, with or without rosacea, means we need to look at intestinal dysbiosis, creating increased intestinal permeability, which leads to food sensitivities/allergies, increased toxin absorption and liver dysfunction. The inflammation that follows can lead to liver production of inflammatory estrogens, and poor sleep patterns that will affect the FSH/LH (ovulatory hormone) ratio leading to ovulatory problems, especially corpus luteum insufficiency, and low progesterone levels. Simple carbohydrates and sugars can be a major trigger of rosacea by increasing small intestine bacterial overgrowth (SIBO), leading to increased gut fermentation and leaky gut. Rosacea has another area of gut connectivity which is a relatively new concept—leaky stomach syndrome. It has been shown that chronic H. Pylori gastric infection increases the transport of sugar and white blood cells (neutrophils) through the stomach wall, which may be corrected by treating the H. pylori with antibiotics. Rosacea, like many other skin conditions, is the result of internal imbalances that begin in the gut. People with rosacea often have dysbiosis, or an imbalance in the ratio of good to bad intestinal bacteria. This imbalance creates inflammation and leaky gut, which allows bacteria, toxins and undigested food particles to enter the bloodstream, overburdening the liver. What the liver cannot process, the body will try to eliminate. Since the skin is a major organ of elimination, the body will try to eliminate toxins through the skin. Replacing beneficial gut bacteria with probiotics is an important part of rebalancing the gut in people with rosacea, in addition to maintaining regular bowel movements with a high-fiber diet. Follow the recommendations below for a whole-body approach to treating rosacea. • Follow the Skinny Gut Diet Eating Plan for optimal health when dealing with rosacea. • Avoid certain foods such as saturated fats, trans fats, alcohol, caffeine, dairy, chocolate and spicy foods, as these may trigger rosacea in some people. • Also, avoiding hot beverages may be helpful. • Extremes of temperature may trigger rosacea, so it may help to avoid these conditions. • Colon hydrotherapy is helpful to aid detoxification.